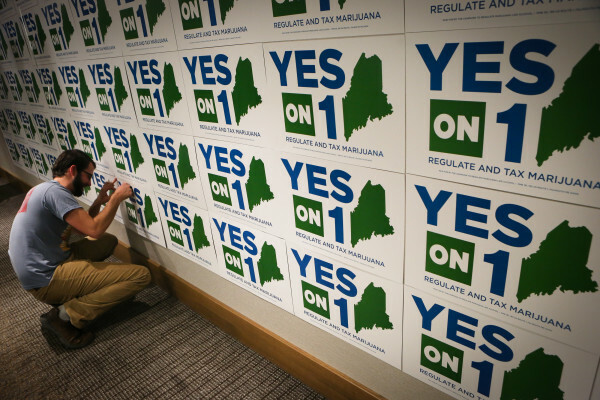 Nick Murray pins a sign to a wall at the Yes on 1 election night headquarters in Portland on Tuesday night. 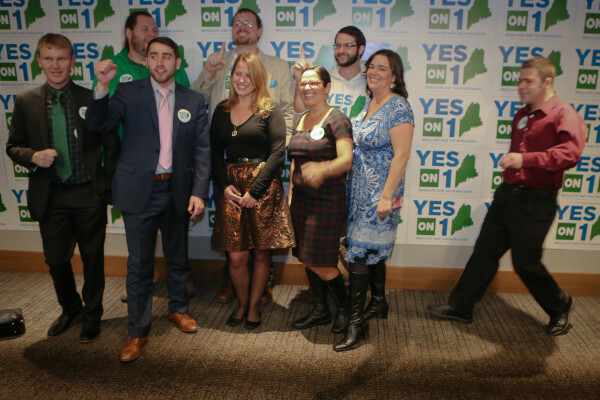 Supporters and organizers chant and pose for a photo at the Yes on 1 campaign party in Tuesday night in Portland. PORTLAND, Maine — Maine will join Massachusetts in legalizing the recreational use of marijuana, becoming one of two first eastern states in the country to open its doors to the multimillion-dollar industry. But a close result has raised the possibility that opponents, who have not formally conceded, will seek a recount for the hotly contested ballot question. The Bangor Daily News declared a Yes win for the race about 3 a.m. Wednesday, based on vote tallies collected from individual towns. Passage of Question 1 puts Maine among four states that legalized recreational marijuana use in earlier years. Nevada and California voted on Tuesday to legalize the drug, which still is an illegal substance under federal law. “We’re excited that Mainers have chosen to adopt a more sensible marijuana policy, a policy in which we are not punishing Mainers for using a substance that is safer than alcohol,” David Boyer, the campaign manager for the “yes” side, said. Scott Gagnon, who led the opposition to Question 1, said early Wednesday morning that he was disappointed with the results of the referendum, but that there is a lot of work left to do on it when it goes to the Legislature next year for review. Gagnon attributed the apparent passage of the question to his campaign being vastly outspent. Among the issues with the current legislation is that it would technically impose no age limit for use or possession. Another area in which Gagnon said he hopes to assist is helping towns and cities that don’t want marijuana retail establishments avoid them. “It’s very disappointing that Maine has passed a law that is going to make lawful possession under age 21,” Gagnon said. But Gagnon said later Wednesday morning that his campaign would not concede until all the results are counted, and the campaign was still holding out hope as of 4 p.m. Wednesday. Vote totals were still coming in, and the No campaign said a batch of about 4,000 absentee ballots from abroad had not yet been counted. The Yes campaign was leading by about 4,000 votes based on the latest tallies. Polling just before Election Day showed that Maine voters were almost evenly split on the question and that it could go either way, leading to the close results into Tuesday night. Earlier polling showed legalization supporters holding an advantage. Passage of the question in Maine makes it legal for adults 21 and older to possess 2.5 ounces of marijuana. The state will then develop rules to regulate retail sales of marijuana, taxed at 10 percent. The law takes effect 30 days after Gov. Paul LePage certifies the election results. The retail industry will be regulated by the legalization-opposing governor’s agriculture department, whose commissioner has called it a “major departure” from the agency’s normal work. Industry watchers Arcview Market Research and New Frontier Analytics projected that legalized marijuana would grow to $200 million in annual sales in Maine and $773 million in Massachusetts by 2020. It estimated the five states considering legalization Tuesday would add $6 billion in sales to the national retail marijuana market by 2020. After taking effect, the department has nine months to come up with rules for licensing retail marijuana sellers and first-in-the-nation “marijuana social clubs,” where marijuana can be bought and consumed on site. The question gives municipal governments the ability to ban or restrict such businesses within their boundaries. That has already set off votes in Bangor, a proposal in Portland and consideration in other municipalities of moratoriums on marijuana shops. Medical marijuana caregivers such as Stacy Moore and Christina Tranchemontagne cheered the decision, saying that it would expand access of marijuana to people considering using it to treat medical conditions but who either don’t have the money or diagnosed condition to qualify them for cannabis under the state’s medical marijuana law. The question had divided the medical marijuana caregiver community, with some concerned that their niche market will suffer under the weight of a big new system. That system includes a new cultivation and distribution market allowing up to 800,000 square feet of cultivation space statewide, with 40 percent reserved for grows of 3,000 square feet or fewer. Caregivers and dispensaries get first priority for licenses. Some of those caregivers joined marijuana opponents to fight the measure, sometimes loudly. Campaign leaders were heckled when delivering signatures to Augusta to qualify for the ballot earlier this year. The law also directs the state to come up with licensing rules for cultivation facilities, marijuana product manufacturers and testing laboratories that will monitor products for compliance with state rules capping the potency of marijuana products. In 1999, a Maine referendum allowed medical use of marijuana. Access wasn’t settled until 2009, when another citizen’s initiative established the current system of eight state-licensed dispensaries and individual caregivers that now number more than 2,900. A concern with the question was limiting children’s exposure to the drug, particularly through candy-shaped edibles. Maine Attorney General Janet Mills and county prosecutors have said that the question removes juvenile marijuana possession penalties from state law, effectively making it legal for children to possess up to 2.5 ounces of marijuana. The campaign faced a tough road to the ballot, with qualifying signatures initially invalidated by Secretary of State Matthew Dunlap. A Superior Court judge overturned that decision in April, clearing the way for the question to appear on the November ballot. BDN writer Christopher Cousins contributed to this report.